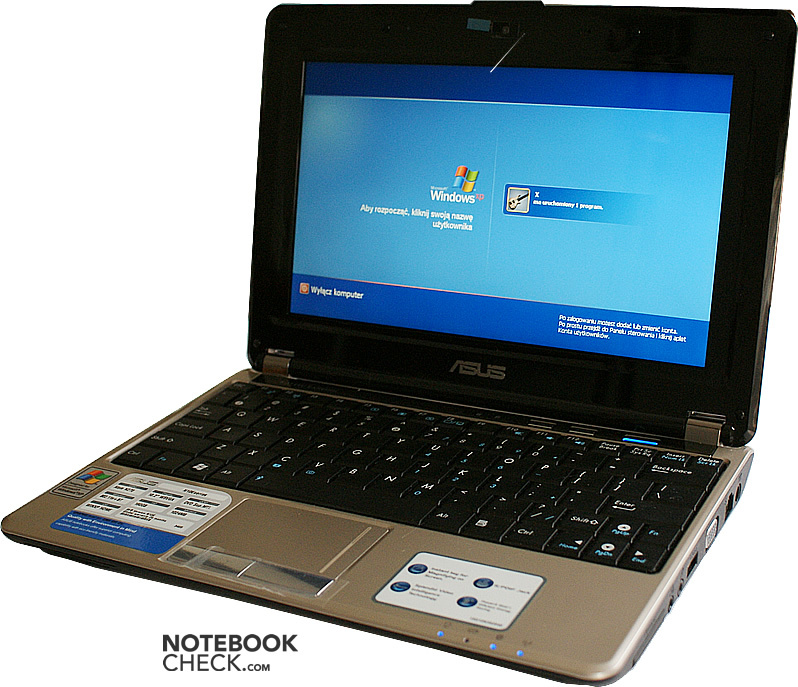 Asus N10E is one of the lastest additions to the broad range of Asus notebooks. It's an unusally well equipped mini-laptop and thus almost qualifies for a luxury netbook. Although one could simply call the N10E another Eee PC in a more splendid package, such a generalization is not justifiable, because it does not cope with many aspects, which are covered in detail in this article. 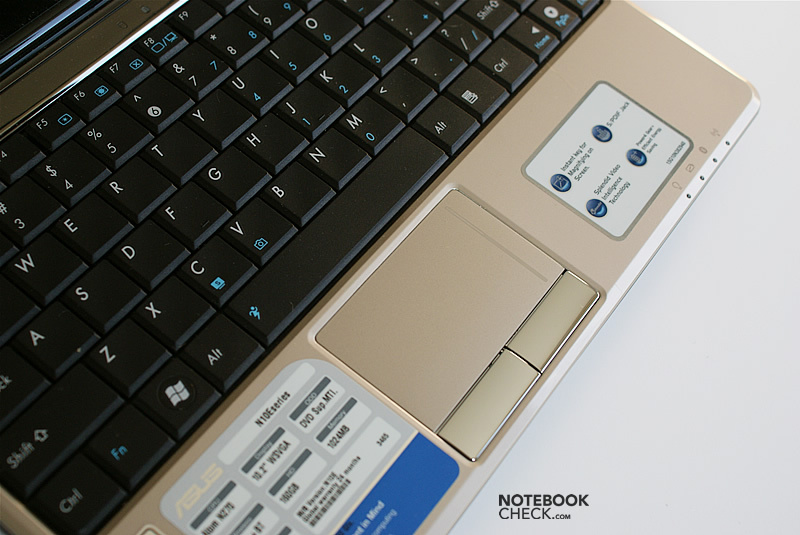 Many thanks to our Polish editor team fromnotebookcheck.pl, who tested this notebook and kindly provided us with their review. The case of the N10E looks like having combined the size of the Eee PC and the finish of some bigger and more expensive Asus notebooks. 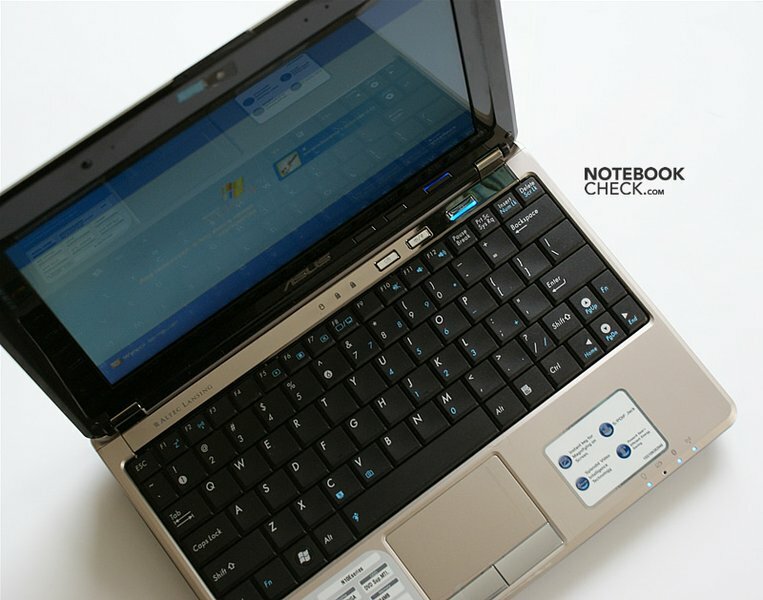 At the first glance it's hard to even tell whether it's a netbook or a notebook. 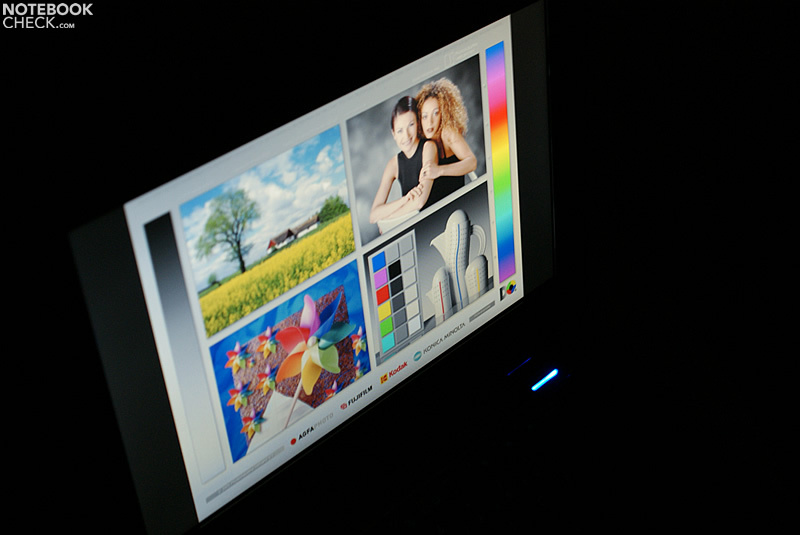 Although the N10E looks like a high-quality product, its design is not that attracting as, for example, the HP 2133 with its distinct metal chassis. Only some parts with chrome finish stand out a little bit. Even though the case of the Asus N10E is made of plastic, its quality is very good and better than the Eee PC by far. High quality materials were chosen and all parts are put together neatly. It does not creak and nothing gives or projects, except of the battery. But, this is due to the size of the 6-cell battery and not due to poor workmanship. 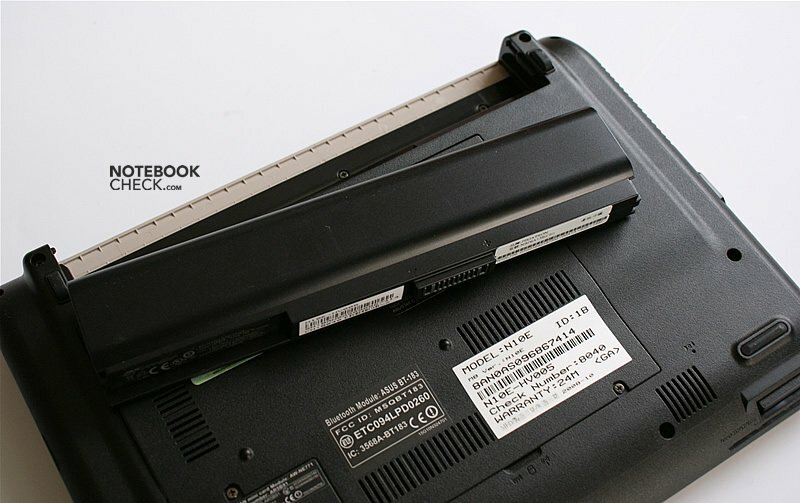 With a weight of 1.57 kg (including battery) the N10E is one of the largest and heaviest netbooks on the market. Nevertheless, it is still not too heavy to be carried around. However, the Asus N10E could be definitely smaller as the display is clearly smaller than the lid, so, giving a big frame around the screen. All the parts, including the slightly coarse underside, are feel nice to the touch. 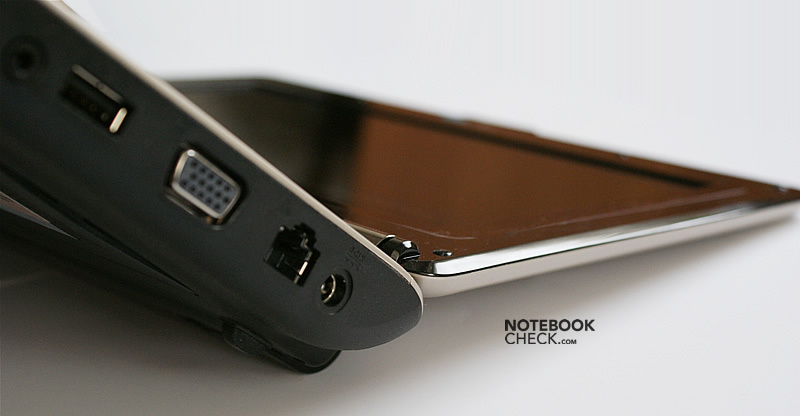 Accordingly, handling the N10E feels like working with exquisite hardware. 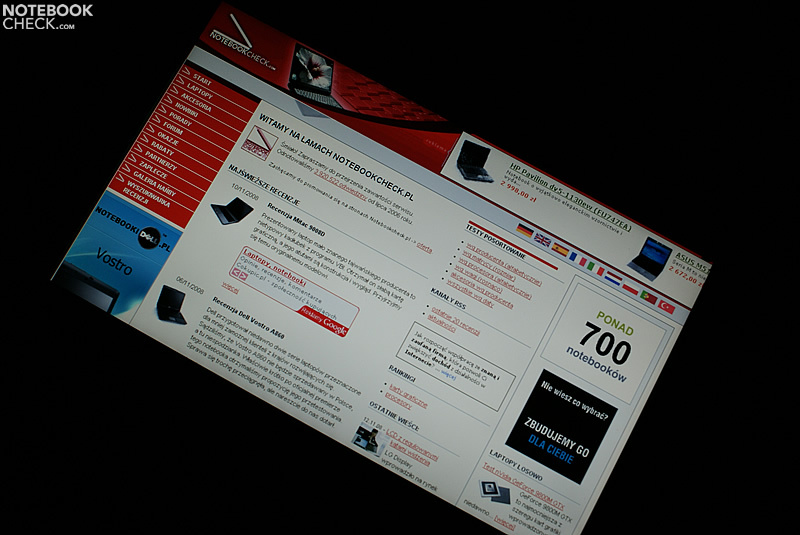 The opening angle of the screen is restricted to 150 degrees, but, this limit the usability of the N10E. The hinges are doing a great job and the screen can be smoothly and effortlessly adjusted, although it tends to slightly fall back if opened to maximum. Besides that, the hinges keep the display safely in position and successfully prevent any see-saw. 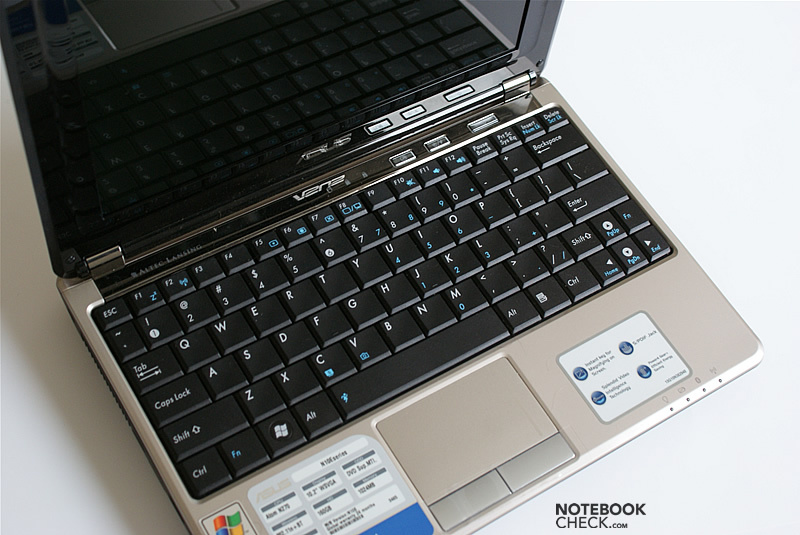 The connectivity of the Asus N10E clearly stands out compared to other netbooks. Apart from three USB ports there is also a S/PDIF and an ExpressCard slot, which are rather rare in this class. 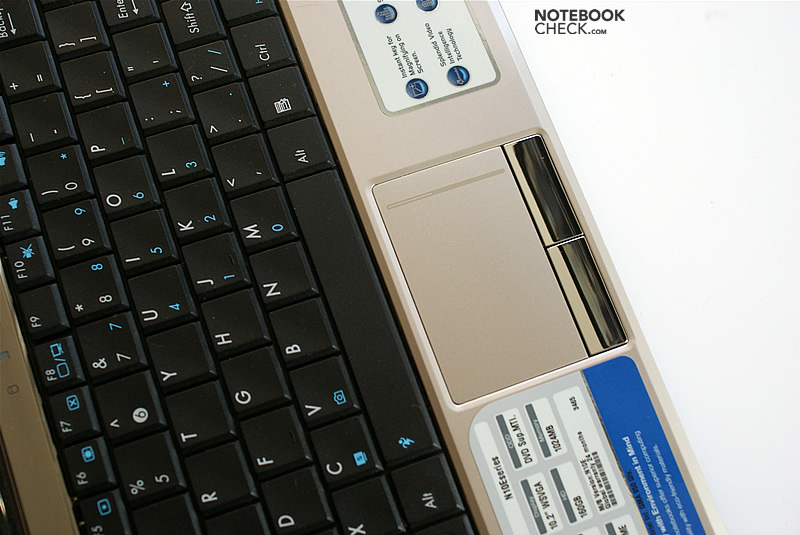 All Asus notebooks of the N series share a similar keyboard. Thus, the keyboard layout of the N10E and, e.g., the N50 are nearly identical. However, the keyboard of the former is smaller (narrower) and without an extra numeric keypad. 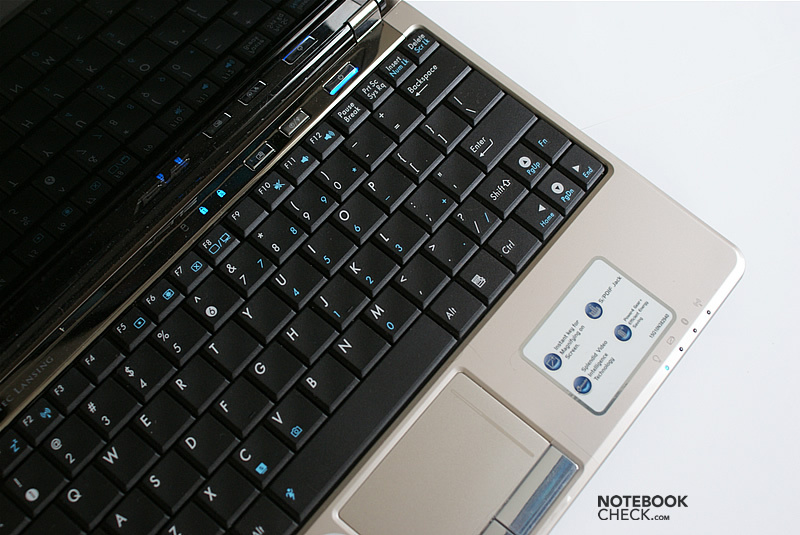 For the sake of a user-friendly keyboard, Asus made the N10E considerably broader than other netbooks. As a result the important keys are all surprisingly big. That is except of the right Shift key, which is at least in an easily accessible place. 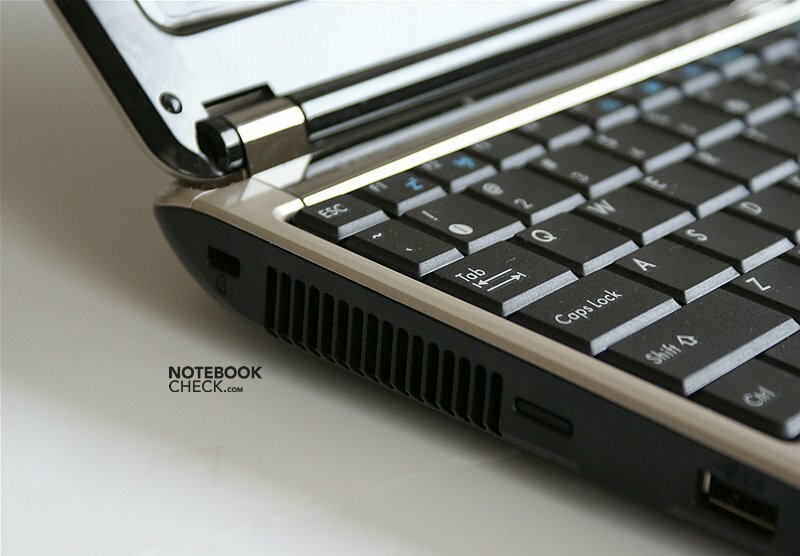 To live up to its reputation as a high-end netbook, the keyboard of the N10E is well protected and hardly gives while typing. The keys have a short travel and bit higher resistance, so, the keyboard is in this aspect similar to keyboards in HP business laptops. The touchpad is even better. It is one of the best, if not the best that you can find in mini-notebooks at the moment. The pad has very good gliding capabilities and the pointer moves fast and precisely to the desired position. Additionally, the accompanying buttons are great too, because of their ultra short travel and their very quiet operation. 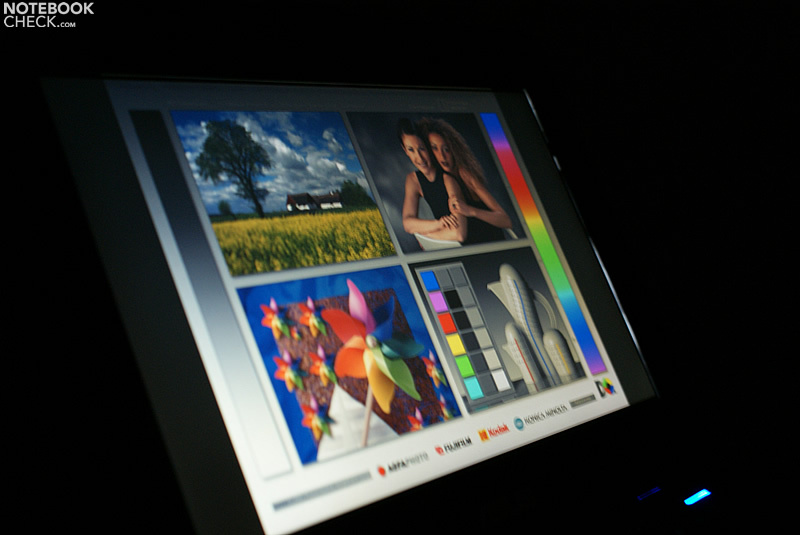 The glossy 10.2” WSVGA (1024x600) screen made by CPT is enclosed in a wide frame. The extra space around the screen was necessary to make the display lid fit neatly on the unusually large base unit. The doesn’t look particularly good, especially because of its glossy finish, but this is a matter of taste. 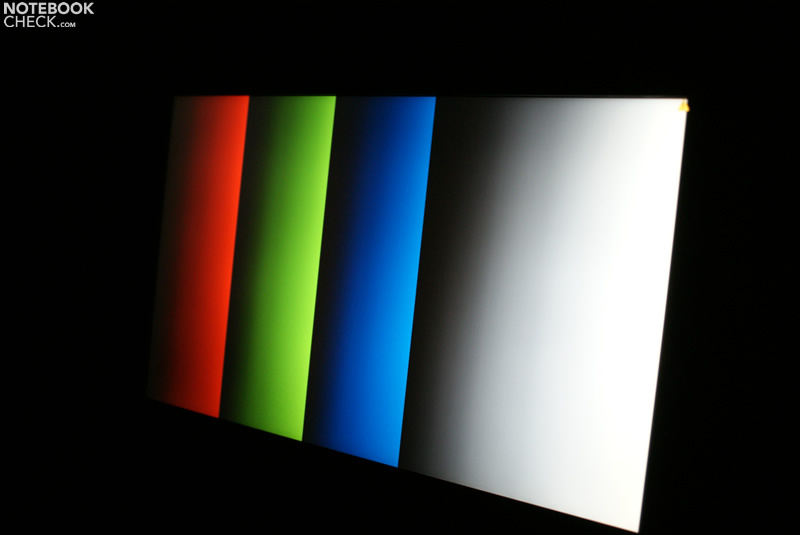 More serious are the artifacts, which appear on the screen if the display frame is pressed with a thumb. 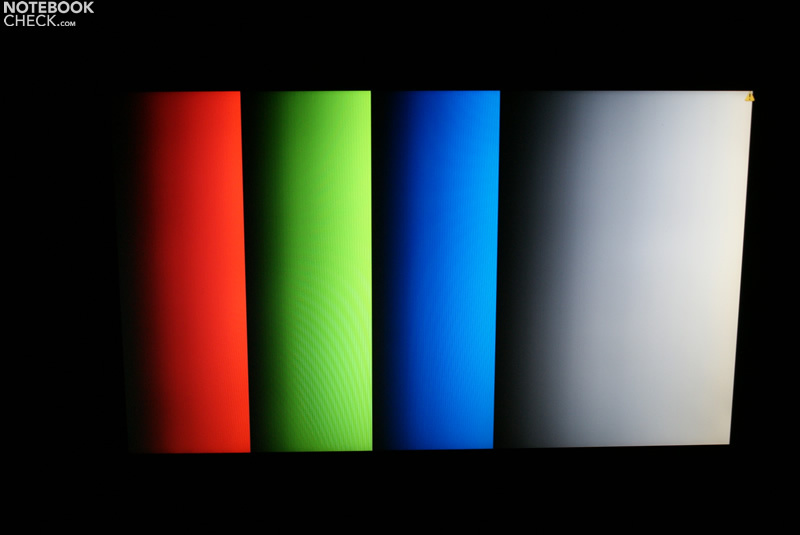 Another problem of the display is the low vertical resolution. The working space is wide enough, but a height of only 600 pixel is insufficient to view the content of, e.g., long documets properly. 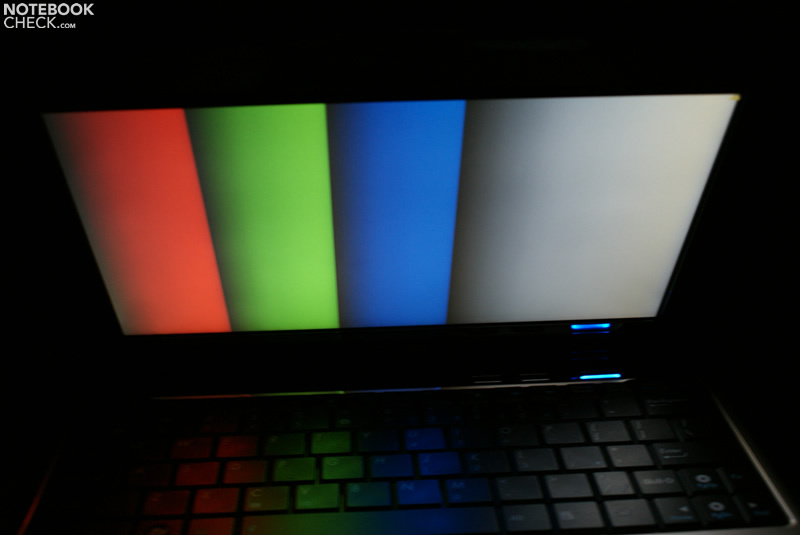 The screen of the Asus N10E showed a clear image, which is especially positive since many netbooks have problems with grainy images. The brightness seemed more than acceptable to our eye, with an average of 200cd/m². As the screen has a glossy surface, outdoor work might get cumbersome due to reflections. 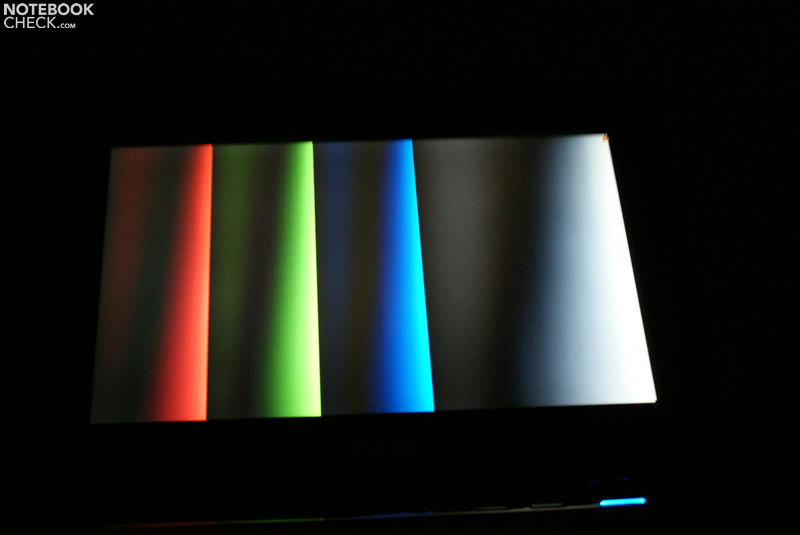 Compared to other netbooks the screen of Asus N10E has not the best viewing angles and colors. The deep black on the other hand is encouraging. And so is, the maximum contrast, which amounts to 400:1. 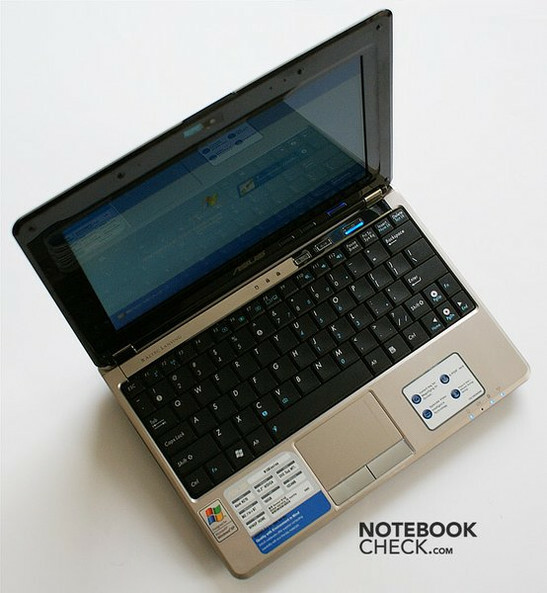 The Intel Atom N270 1.6GHz processor has been used in the majority of recent netbooks, so Asus N10E ranks on par with them in terms of performance. It is significantly better than the VIA C7-M used in the HP Mini-Note 2133 and the Celeron M used in some Eee PC models. Depending on the test, the difference amounts to 10-15 percent. Since the Asus N10E is based on the Intel Atom platform, it is equipped with the 945GSE Express chipset which includes the integrated GMA 950 graphics chip. 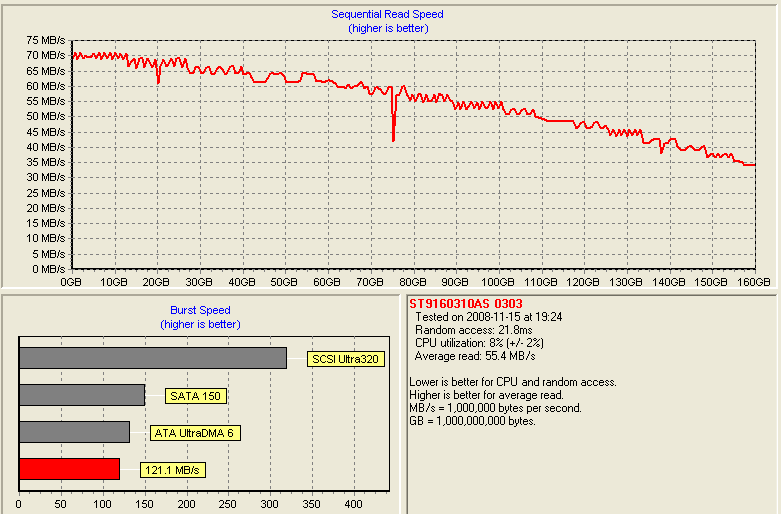 With only 166MHz it is quite a bit slower than the version used in bigger notebooks, which has 250MHz. One thing that sets the Asus N10E apart from most netbooks is a fast hard disk made by Seagate, with a capacity of 160GB and a speed of 5400rpm. 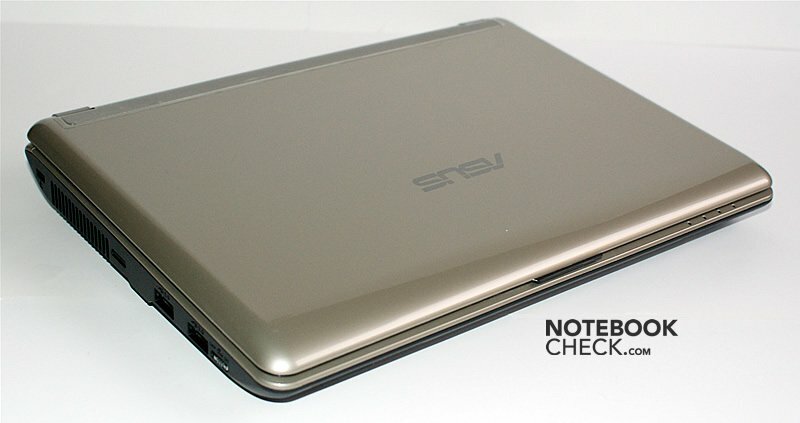 According to our tests, the Asus N10E is a rather quiet netbook. But, the reality is not as rosy as the measured data would imply. When ever the noise comes only from the hard drive, which is often the case, the noise is especially noticeable in quiet environments. 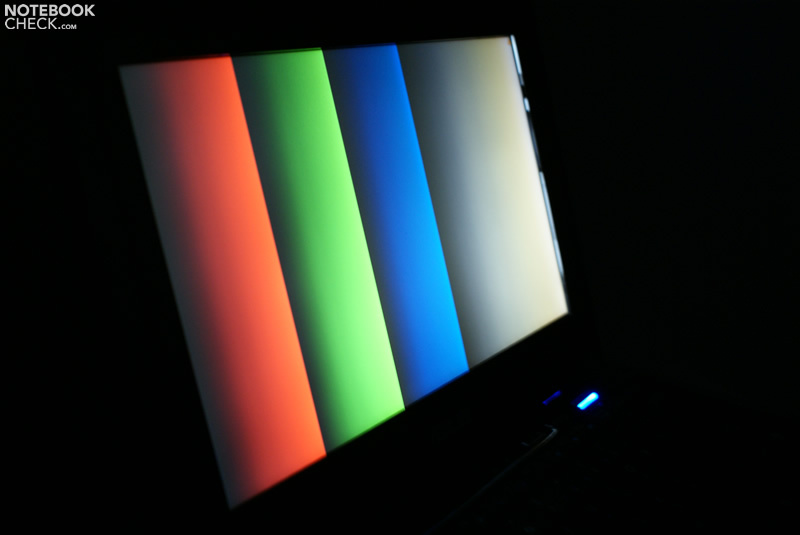 Under load and sometimes even when the computer is dealing with not very demanding applications, the fan becomes audible. Although the noise level is only 32.6dB, it is perceived as rather annoying for some reason. Perhaps this is due to the metallic tone of the noise. Even under load the surfaces of the Asus N10E never gets too hot. The maximum measured temperature, 37.5° Celsius measured on the bottom side, is still moderate. (±) The average temperature for the upper side under maximal load is 32.5 °C / 91 F, compared to the average of 29.8 °C / 86 F for the devices in the class Netbook. (+) The maximum temperature on the upper side is 34.5 °C / 94 F, compared to the average of 33 °C / 91 F, ranging from 21.6 to 53.2 °C for the class Netbook. (-) The average temperature of the palmrest area of similar devices was 29.3 °C / 84.7 F (-4.1 °C / -7.4 F). There aren’t many netbooks with good speakers, but, the N10E got speakers made by Altec Lansing. However, these were hidden on the underside, far from the front edge, so the sound they produce is muffled, if the netbook is not held up in the air. The quality of the sound is naturally a bit better than in regular mini-laptops, but nowhere near the quality of HP 2133, whose speakers give a really great sound for a netbook. The Asus N10E is characterized by a relatively good battery runtime, but in order to accomplish this it is necessary to choose the 6 cell battery instead of the three cell one. The 6 cell battery has a capacity of 53Wh and keeps the N10E running for up to 5 hours, which conforms to the announced battery runtime in the advertisement of the producer. Because people kept asking us whether it is possible to exclusively use a netbook and no other computer, we decided to try to use a netbook as the only computer for some time. 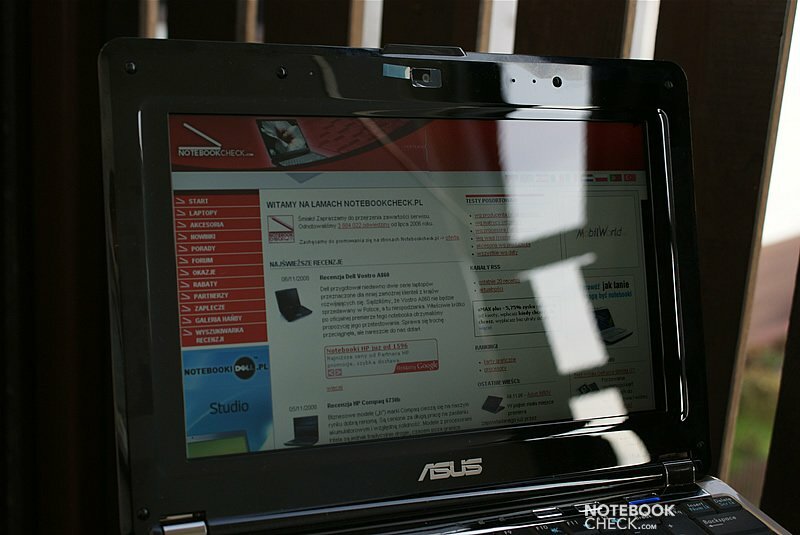 For a few days one of our reviewers used only the Asus N10E. However, even though 10" is currently the largest screen size in the netbook class, his eyes started to hurt when he used it for a time span of a couple of hours. So a netbook alone is not sufficient, at least if you have to work on it for hours. 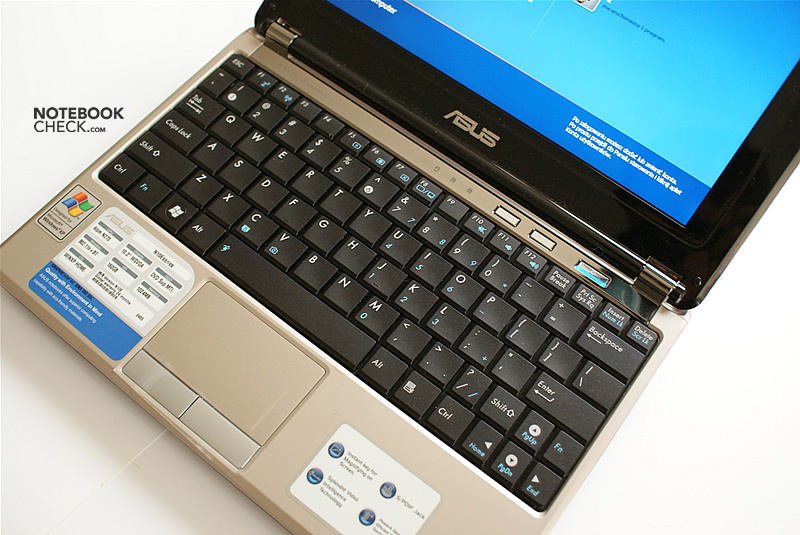 But if you just need a computer to occasionally check e-mails or to write short texts, you might be able to get by without any other computer, especially considering that the keyboard of the Asus N10E is very user-friendly. 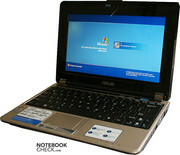 Some describe the Asus N10 series as netbooks which aren't really netbooks. 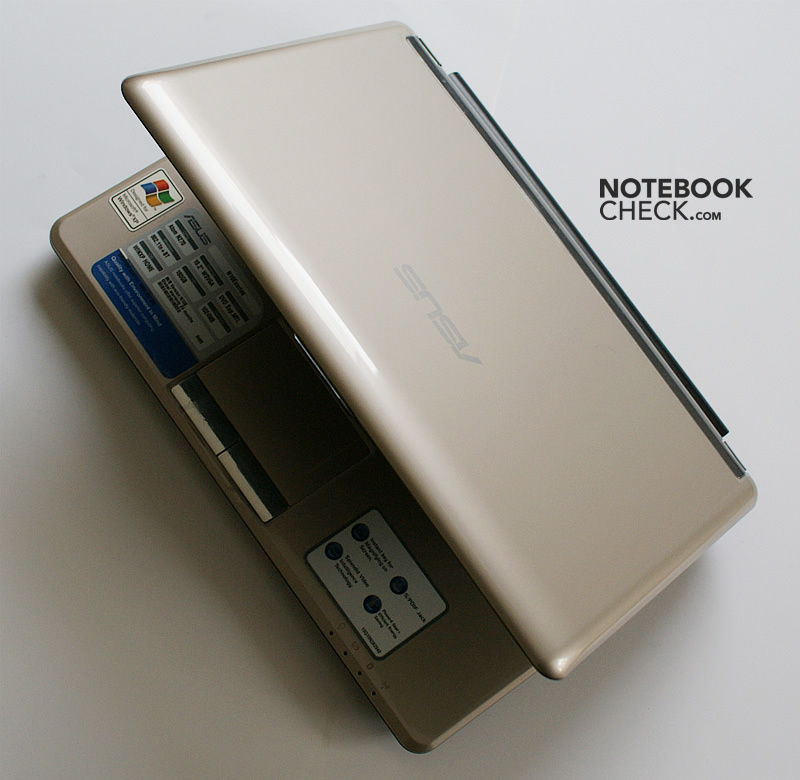 The reason is the Asus N10 clearly differs from the typical netbook in some aspects. 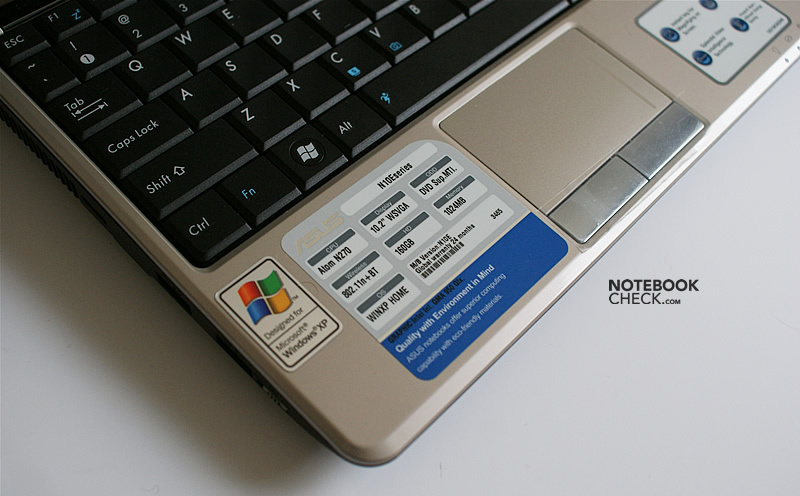 However, since the N10E is based on the Atom platform and has only an integrated graphics chip like most other netbooks, the N10E model is at least "normal" in that sense. Other models in this series have hybrid graphics with a dedicated graphics card. But its extensive connectivity, its large and fast hard disk, and brand speakers make it stand out of other netbooks and brings it closer to bigger notebooks. Since we tend to put emphasis on the value of tested laptops in relation to their price, it might seem at first as if the Asus N10E has only small chances of winning our favour, as this is one of the more expensive netbooks. But we appreciate the quality of the Asus mini-notebook and its rather small size, at least compared with regular notebooks. The usually small size of netbooks was sacrificed in order to make the keyboard large and thus comfortable to type on. Therefore it isn't as handy as its rivals and it's also one of the heaviest of its class (it weighs over 150g more than the Eee PC 1000H). However, this trade-off was worth it, because Asus managed to put a keyboard into the N10E, which resembles a standard keyboard that allows fast and accurate typing. Although Asus tried hard not to create ‘just another netbook’, it surely is one – a computer used to check e-mails and to access the web. The performance level is on par with the majority of newer netbooks. If Asus really wants to create a new class, then it could do so only for the models with dedicated graphics card. The screen is a bit too small to work in front of it for hours, but the pretty long battery life of up to 5 hours could keep the N10E running during that time. The final question: Is the N10E worth it or not? Definitely, if you are looking for a small notebook that can handle standard office tasks with ease. 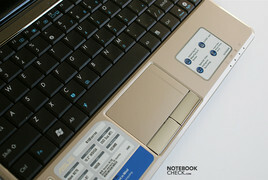 It is hard to tell whether the Asus N10E is a netbook or a subnotebook. 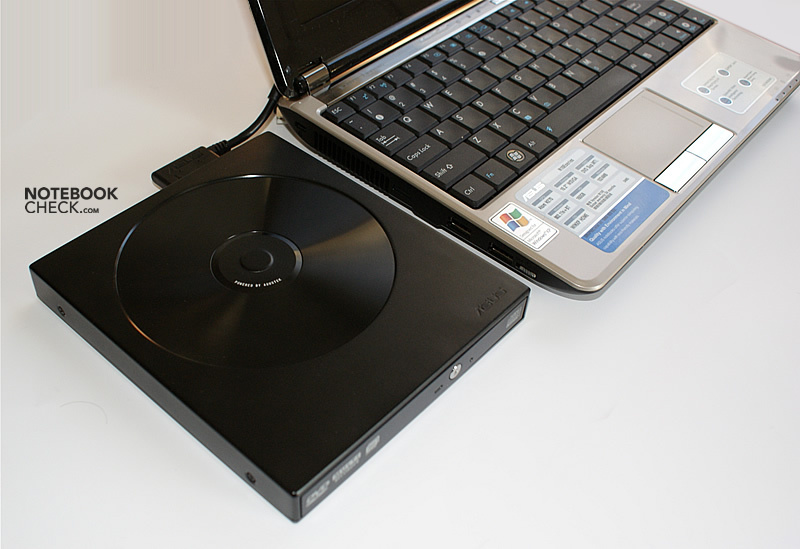 An external DVD drive might be of the things you might want to buy as accessory. 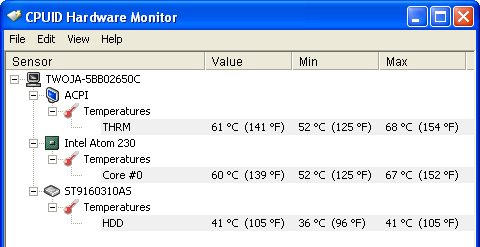 The Asus N10E is not absolutely quiet, but the fan is not very loud. The battery protrudes a bit on the back. ...and the touchpad is one of the best in netbooks. 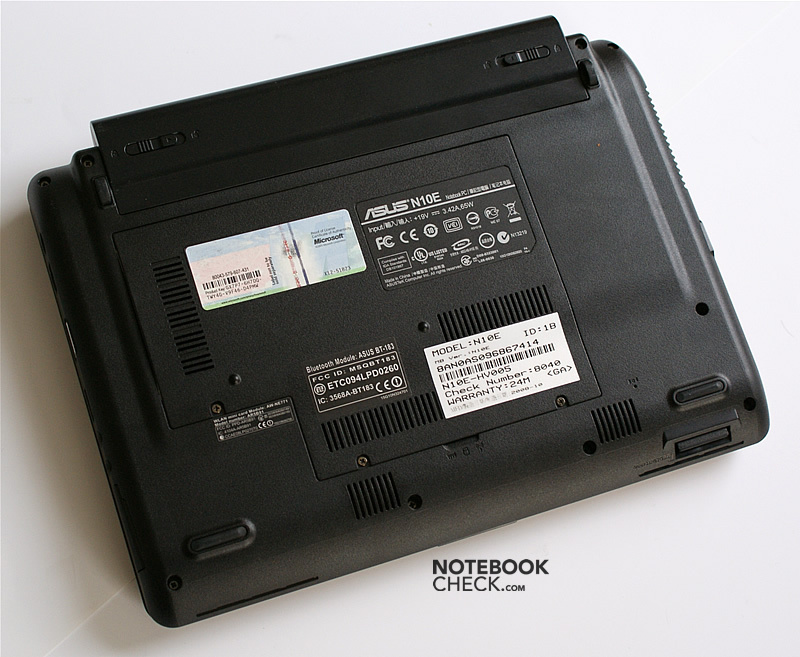 The Atom CPU and the small screen size are typical for netbooks, but the large and fast hard disk is not. 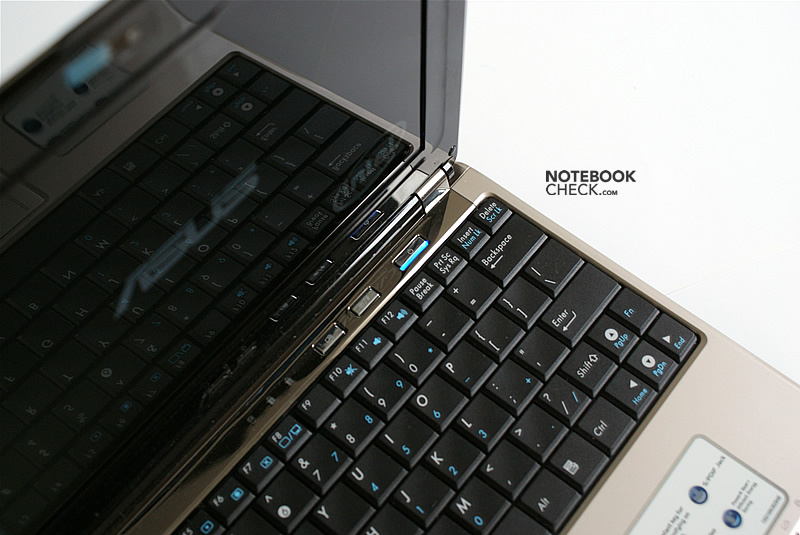 This netbook combines great quality and nice design. ...for using this laptop in various situations. ...and a keyboard with large keys. ...which is sufficient for up to 5 hours of work.